BAIE-SAINT-PAUL, Quebec – You'd be hard pressed to find two vehicles more dissimilar than the Lexus IS 300 AWD and the LX 570, which has been the top dog of the utility vehicle lineup for Toyota's luxury and prestige division for 20 years. The first is a svelte compact luxury sedan and the second is a gigantic go-anywhere vehicle that seems like a throwback from another era. That isn't far from the truth actually, although Lexus works hard to keep it up to date, especially the 2016 edition. Between these two seemingly polar opposites, there's the NX 200t as well as the RX 350 and RX 450h brothers. They’re modern SUVs that borrow freely from the automobile as do all similar and rival vehicles. Lexus brought together all of these AWD vehicles so that journalists could have a chance to get to know them better on the rolling roads of Quebec’s Charlevoix region. All of these vehicles also feature Lexus’ characteristic spindle grille. Sometimes big, sometimes massive, this grille is either ribbed with horizontal bars or clad in honeycomb black, like the one on the excellent F SPORT versions. This grille finally gives Lexus an identity all its own. People generally love it or hate it, but this much is for sure: you will most certainly recognize it. That’s the point, of course. And it explains, at least in part, why this has been a record sales year for Lexus. In fact, it’s been the best year in Lexus’ history. Any other year, snowy and icy roads would have been the order of the day, but Quebec is having an abnormally mild season and very little snow has fallen so far this year. So we had to drive these built-to-stand-up-to-the-rigours-of-Canadian-winters Lexus products on asphalt that was either dry or simply rained on and fogged in. 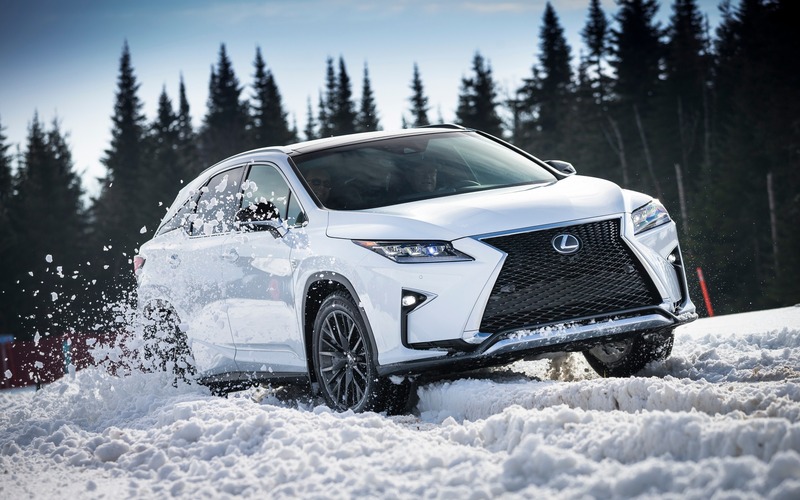 Fortunately, the Lexus AWD Event was organized the next day to give the public the chance to test the NX and RX on a special course at Charlevoix’s Le Massif ski centre. It consisted of a snowy rectangle a few hundred metres long that combined a series of hills, a tight slalom, two big turns and a longer and faster slalom to finish. The journalists had a first crack at this course behind the wheel of the RX 350 with a 3.5-litre V6, seriously redesigned for 2016. We also tried the NX 200t powered by a 2.0-litre, 235-horsepower four-cylinder turbo. Lack of snow wasn’t a problem, Le Massif’s cannons adding a nice layer of artificial crystals to the few centimetres of real stuff that had already fallen. In fact, there was even too much of this heavy and compact snow. The first NX and RX got through without much trouble, but left zigzagging ruts twenty-odd centimetres deep behind them. When it was my turn, the RX 350 refused to take the first big corner, its midsection getting stuck in the packed snow. I looked like an idiot. They even needed one of Le Massif’s grooming machines with caterpillars to dig it out. In the back section, a long climbing slalom, the engine cut at the slightest sideways movement, even with the pedal to the metal. It was very frustrating, but the solution was simple: expert technician Peter Nytko advised us to deactivate the stability and traction controls by holding the button down for several seconds. On the first course, the NX 200t devoured big bumps, cut over the ruts and powered through turns and slaloms spraying snow. The oversteer was easily controlled with the accelerator. I looked like a rally driver instead of a beginner. Now that’s more like it! The RX 350 redeemed itself on the second attempt once the two systems were deactivated. With the 295 horsepower and improved torque of the revamped 3.5-litre V6 compensating for its 265 additional kg, it fared as well as the NX, even though it was less agile. In both cases, the machinery is linear and the actuation is impeccable in this thick snow on totally normal snow tires. The IS sedans were left out of this exercise for obvious reasons. The huge LX 570 sat this one out because our hosts were worried, at three tonnes, that it would destroy the course. We’re not kidding, either. It weighs 6,000 lbs. or 2,720 kg, according to its official technical specifications. Too bad, because the venerable LX is the only true all-terrain vehicle in the group with its sturdy body-over-frame design, four-wheel drive with transfer case, short gear range, Torsen locking central differential, 225-mm (9-inch) ground clearance and suspension with adjustable leveling system. There’s also a rotary dial to select one of the five driving modes designed for specific conditions that don’t involve smooth asphalt. All that helps it easily honour its 3,175-kg (7,000-lb.) towing capacity with the 383 horsepower and 403 lb.-ft. of torque of its 5.7-litre V8. Fuel consumption is obviously proportionate, with gigantic city/highway/combined numbers of 18.3/12.9/15.9 L per 100 km. The big and heavy LX climbed the infamous Côte de Beaupré along with all the other hills that followed as we made our way to Baie-Saint-Paul. The vehicle never broke a sweat thanks in part to its big V8, but mainly because of its new eight-speed automatic gearbox. Word to the wise: take it easy on the accelerator because you don’t feel like you’re going fast in this boat on wheels, especially with Lexus’ usual top-notch soundproofing. The RX 350’s new eight-speed gearbox also did wonders on the rollercoaster hills leading up to La Malbaie — even while discretely descending and climbing the legendary Côte-à-Godin that leads to Saint-Joseph-de-la-Rive, with its 20% slopes over several kilometres. The gearbox unmistakably finds the right gear to get the most out of a revamped naturally aspirated V6. Note that this mill still doesn’t have the muscle of a V8, despite the modifications made this year. Estimated fuel consumption promises to be more reasonable though, with numbers of 12.2, 8.9 and 10.7 L per 100 km. The hybrid RX 450h is more expensive and heavier, but it does even better with figures of 7.7/8.2 and 8.0. On the way to the mountain peak at Petite-Rivière-Saint-François, which involves an endless uphill climb, we felt like the RX 450h was being pulled by a giant elastic, thanks to its electric motors and continuously variable transmission. Press the right pedal and it accelerates proportionately with a strangely hydraulic smoothness. The RX 350 and 450h are infinitely more modern than the LX, both in terms of style and handling. They had the excellent idea of introducing F SPORT versions, which are always the best. With their laser-cut black grille and silhouette, these versions wouldn’t be at all out of place in the latest Star Wars flick. It’s even better on the inside with a nice sport steering wheel, nicely sculpted seats, light-coloured dials, aluminum pedals with a large footrest, an electronic parking brake and a remarkably clear 12.3-inch centre screen. It’s enough to make us overlook the most recent version of the bizarre mouse-like device that’s mounted on the left side of the console, despite its frustrating and distracting lack of precision when driving. Well, we can almost overlook it. All of these Lexus products, including the IS 300 AWD sedan that we drove sensibly on the return to Quebec City, feature the brand’s signature refinement and smoothness, not to mention the glut of accessories and systems whose list grows with the cost of option packages. The most interesting are the F SPORT packages, which add the character and dynamism that Lexus lacked for so long. The big LX 570 relies on Sport and Sport + modes, prompting its accelerator to react more sharply, tightening up gear shifting and firming up the suspension. That’s more than enough in this case. In any event, it’s difficult to see what buyers can find in this decidedly classic, $100,000-plus, enormous sport utility vehicle that they wouldn’t find with its attractive rivals, like the Range Rover and Cadillac Escalade. Oh yeah, that’s right: how about unequaled reliability and durability? There are always takers for these all-too-rare qualities. Tips & Advice: Protect your car Isn’t AWD The Answer?